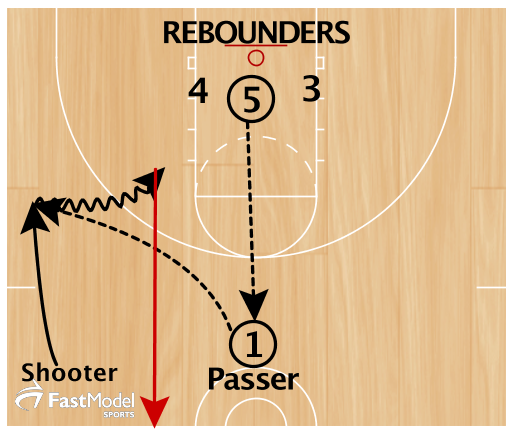 I hope that you are able to use this drill in practice for some of your better shooters. Or better yet, can adapt it to the skills that your shooters have or need to acquire. I saw Stephen Curry doing this before a game so we decided to make a drill out of it. This is a great drill because you (1) get conditioning and game type shots, (2) movement and (3) you can use both sides of the floor. On a make the routine is the same. 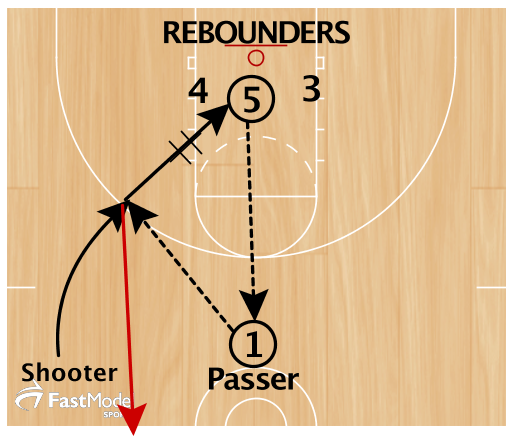 After a miss, the passer throws the ball out in front of the shooter. The shooter must catch, make a move and take a mid-range shot. The Shooter must make 3 3pt shots to complete the drill. They do not have to be in a row. Mid range Shots do not count as a make. Advanced: The Shooter must make 4/5 shots including the mid-range if they miss a 3pt shot. Expert: The Shooter must make 3 consecutive 3pt shots.